Well, we tried to place winning bids in Meares Auction Group’s Oct. 24 session; but the bidding was so fierce that all of our several maximums failed, proving once again that lowering buyer’s premiums in the spirit of auctioneering always is the best way to spark enthusiastic bidding. Auctioneer Darron Meares says the idea of moving to the 5% buyer’s premium came from watching other successful coin auctioneers on Proxibid and discussing trends with some of the members of Proxibid’s team. “When we began selling coins on Proxibid we were one of the few auctioneers selling coins on the online platform – this, mind you, was in 2006-07 when Proxibid was in it’s infancy,” Meares says. “We were charging 18% BP–yes, I know, it was even high to us–but we were learning the ropes. “Funny side note: we had buyer’s located within 30 miles of us that were paying 24% PLUS shipping (10% BP for company, 5% for Proxibid, 3% for credit card processing and 6% state sales tax). Of course, that is before the South Carolina House passed a law where domestic coins and currency were exempt from sales tax. “Now,” he adds, “as times have changed and the market is flooded with auctioneers–good and bad–we had to roll with the punches. 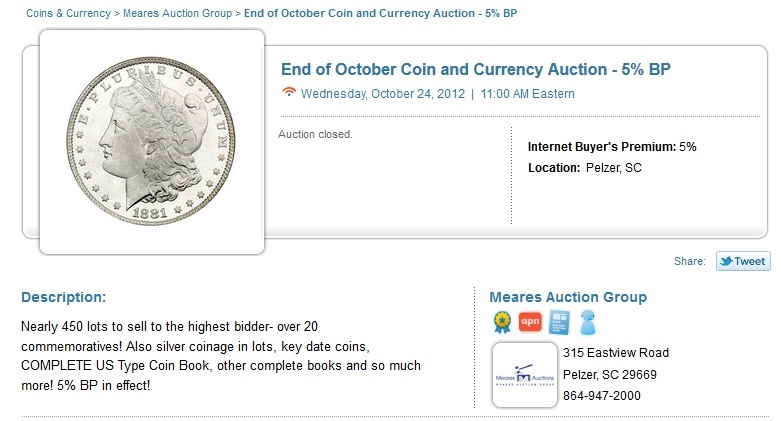 I handle the coin auctions from start to finish, so we are not spending a lot on other personnel. “In looking at the numbers, the 5% would cover Proxibid’s fee and anything sold in house could be tossed back to the company to cover my time (which does have to be accounted for). “Looking at our numbers and comparing them to spot metals around our current level, we gained money. Moreso, in looking at the buyer export from Proxibid we gained 69 new buyers that had never registered for our coin auctions. We hope other auctioneers reading this lower their buyer’s premium. Keep in mind that Meares does not see maximums, does not ghost-bid, offers APN credit card assurance, and is a veteran auctioneer who reads and appreciates how Proxiblog is safeguarding the hobby. Watch for a post soon on our Honor Roll list, which began in May 2011 with only 11 Proxibid auctions that charged a 15% buyer’s premium or lower. Now it has more than 100. Meares joins Southwest Bullion, Liberty Shops Auctions and other proactive companies realizing the best way to spark competition is to provide an even playing field with good online photos, best practices and low BP. We encourage you to bid in Meares’ auctions, knowing you probably will beat our bids because of the competition as we only bid greysheet and then sell our coins to raise funds for our scholarship fund at Iowa State University. This entry was posted in News and tagged Darron Meares, Liberty Shops Auction, Meares Auction Group, Southwest Bullion. Bookmark the permalink.